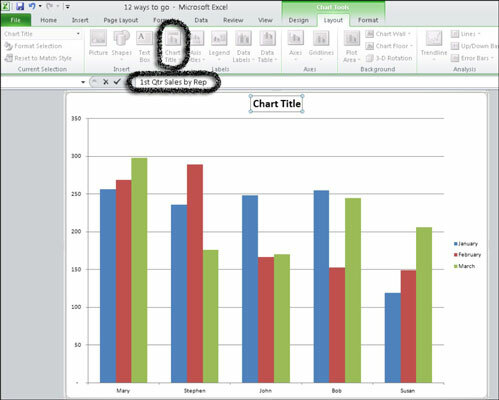 You can add titles to an Excel 2010 chart to help describe its purpose. By default, titles are not added when you create a basic chart, but you can add them later manually. In addition to a main chart title that is generally displayed above a chart, you can add descriptive titles to the x-axis (category axis) and the y-axis (value axis). Click anywhere on the chart you want to modify. On the Chart Tools Layout tab, click the Chart Title button in the Labels group. None: This choice means you don’t want to display a title. Also use this option to remove a chart title you don’t want. Centered Overlay Title: Centers the title over the chart but retains the existing size of the chart. Above Chart: Centers the title over the chart but adds room at the top so the title doesn’t interfere with the chart itself. Make a selection from the Chart Title drop-down list. A box with the words Chart Title appears on the chart. Adding a title to your chart. Double-click the new text box that says “Chart Title” and drag across the words Chart Title. (Optional) To format a title, select it and, on the Chart Tools Layout tab, click Chart Title→More Title Options, and customize to your heart’s content. 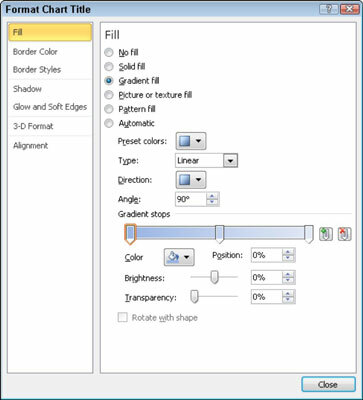 The Format Chart Title dialog box appears. Click any tab and choose any formatting options you want to apply to the title. Click Close when you’re done. You can format chart titles in different ways. (Optional) To add an axis title, click the Axis Titles button on the Chart Tools Layout tab, and then select the axis and the type of title you want to add. Repeat Steps 4–6 to edit the axis title. Did this glimpse into Excel charts leave you longing for more information and insight about Microsoft’s popular spreadsheet program? You’re free to test drive any of the For Dummies eLearning courses. Pick your course (you may be interested in more from Excel 2010), fill out a quick registration, and then give eLearning a spin with the Try It! button. You’ll be right on course for more trusted know how: The full version’s also available at Excel 2010.